Christmas is coming and WoolOvers has the perfect 100% natural Christmas gift for every budget and occasion. The cosiest cashmere, the comfiest cotton, the finest merino wool and much more. Luxurious cashmere socks, cosy sheepskin slippers, soft leather gloves and warm lambswool scarves make great gifts for all the family. Our gifts for Dad include 100% lambswool hats, gloves and scarves as well as sheepskin slippers and cosy cashmere socks. 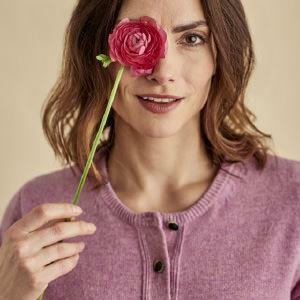 Gifts for Mum include colourful Fairisle jumpers, bright wool hats and scarves or you can spoil Mum with our pure cashmere jumpers and pure cashmere cardigans. Our Christmas gifts are colourful, quality and always 100% natural. We also have fabulous party wear for the holiday season. Shimmer in sequinned cashmere jumpers and dance the night away in 100% natural wool dresses. Don't worry if you leave your Christmas Gift shopping until the last minute. We have instant Christmas Gift Vouchers to download or receive in the post. A great way to give them the Christmas gift they really want.